Map courtesy of Gulf South Pipeline Co.
Gulf South Pipeline Co. (Gulf South) has filed an application with the US Federal Energy Regulatory Commission (FERC) requesting authorization to construct and operate the Willis Lateral Project. 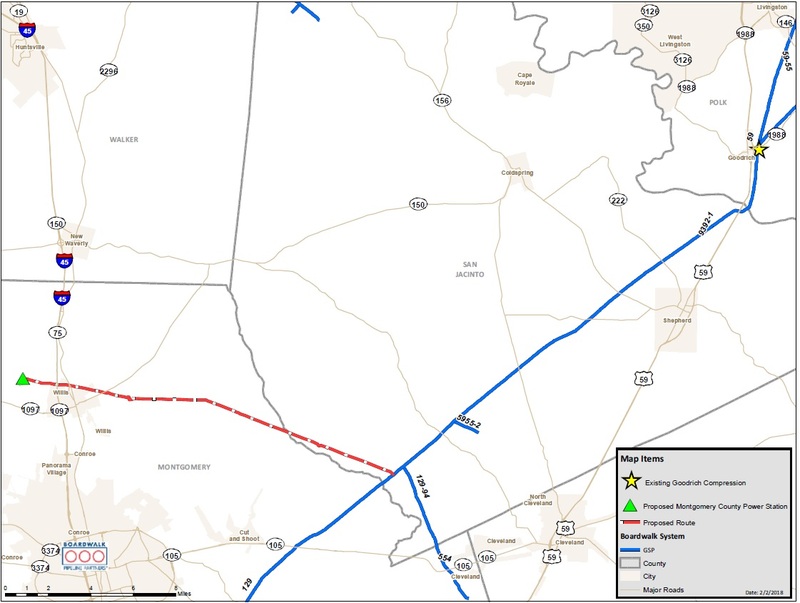 The Willis Lateral Project will consist of 19 miles (30 km) of new 24-in.- (609-mm-) diameter natural gas pipeline; installation of a new 15,876-hp (11,843-kW) Solar Mars 100 gas turbine at Gulf South’s existing Goodrich Compressor Station in Polk County, Texas, USA; and a new delivery meter and regulator (M&R) station and a new receipt M&R station at Gulf South’s existing Goodrich Compressor Station site. The project will allow Gulf South to provide up to 200,000 dekatherms per day of firm transportation service to Entergy Texas Inc.’s Montgomery County Power Station (MCPS) Project, which will be capable of providing nearly one gigawatt of electricity, proposed to be located on Entergy’s existing Lewis Creek Power Station site near Willis, Texas. The Goodrich Compressor Station currently consists of six reciprocating units totaling 7920 hp (5908 kW). The new Solar Mars 100 turbine engine that is proposed to be installed at the Goodrich Compressor Station as part of the project will provide compression sufficient to deliver the full contracted quantities to the new Willis Lateral pipeline for ultimate delivery to the MCPS at the requested delivery pressure under normal operating conditions. The flow diagrams and data demonstrate that the project facilities maximum design flow will create 250,000 dekatherms per day of short haul capacity on Gulf South’s mainline Index 129 between the Gulf South’s Goodrich Compressor Station and Gulf South’s North Houston Compressor Station.